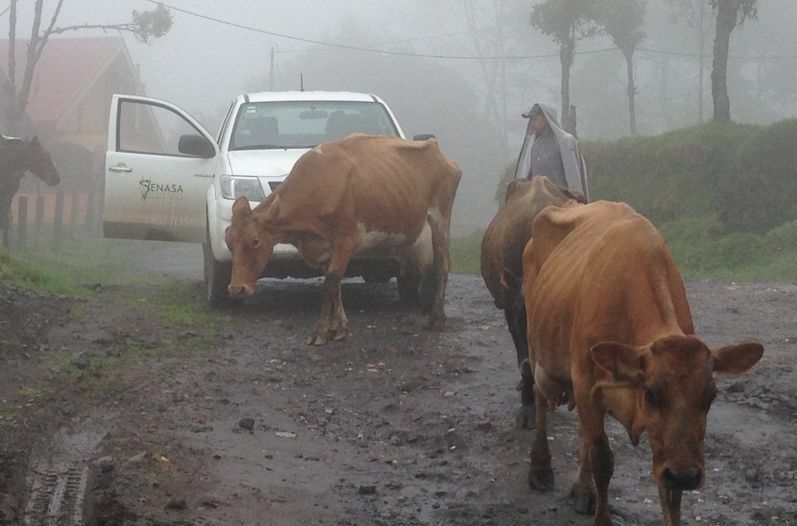 QCOSTARICA – The National Animal Health Service (Servicio Nacional de Salud Animal – SENASA) reported an outbreak of bovine brucellosis in three farms in the area surrounding the Turrialba volcano. According to SENASA, the incidence was confirmed in 44 animals from three different farms, of a total of 19 visited. Thus a quarantine of affected farms was declared, marking the animals testing positive with an “S”and to be slaughtered to prevent the spread of the disease. A purpose of the sampling area is to protect the herds that are free and prevent infection of other animals. Brucellosis in cattle is a highly contagious disease which is spread by infected material at time of calving or abortion and which can also result in infertility, morbidity and reduced milk yield. The organism is readily killed by disinfection. There are also human health risks because the disease may be transmitted by drinking unpasteurised milk from infected cows, by inhalation, cuts and abrasions, or by droplet infection. Bernardo Jaen, SENASA chief, said brucellosis control is extremely important, not only livestock and economic implications that entails, but also because first and foremost priority of SENASA is to ensure public health. The brucellosis surveillance in area around the volcano has beeen strengthened since the eruptions in October 2014. Next articleIt’s Time Limón To Awaken!